Scarce pose of the Brigadier General John Geary. See below for his biography. Brady, NY photographer's b/m. The upper left corner has albumen discoloration that is part of the actual image when it was printed. Born on December 30, 1819, native Pennsylvanian John White Geary gained a reputation as much for his military bravery and leadership as for his political ambitions. The son of Richard and Margaret White Geary, John Geary attended Jefferson College at Canonsburg, Pennsylvania but dropped out when his father died. Geary's father left his family with debt from unsuccessful business ventures, a debt which John Geary worked off as a teacher, a store clerk and as an engineer for the railroad until the Mexican-American War altered Geary's career. Standing six feet, five and half inches tall and rumored to weigh 260 pounds, Geary established his military might and political leadership in the Mexican-American War as the lieutenant colonel of the 2nd Pennsylvania Infantry and later as the military governor of Mexico City. After the conflict with Mexico, Geary served as San Francisco’s first mayor in 1850. When his wife, Margaret Ann Logan, fell gravely ill in 1852, Geary returned to Pennsylvania with his two sons to care for the ailing Margaret, who died in 1853. Three years after his first wife's death, Geary was appointed as the governor of a volatile Kansas by President Franklin Pierce. Geary was decidedly anti-slavery, but his administration in Kansas could not assuage the bloody struggle between pro and anti-slavery factions in the state. In March of 1857, after death threats and repeated calls for his removal, Geary resigned from his position as governor and retired to his farm in Pennsylvania. Back in Pennsylvania, Geary married his second wife, Mary Church Henderson, in August of 1857. Mary gave birth to Geary's third child, a girl, the following year. Geary did not rest long with his family in Pennsylvania. Though he had not received any formal training from West Point like many of his peers, Geary was called back to service at the outbreak of the Civil War. 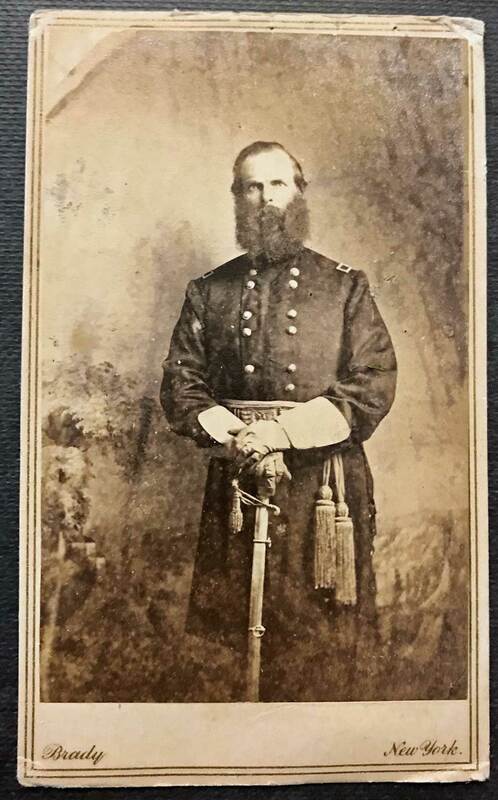 Thanks in part to his demonstrated military skill during the Mexican-American war, Geary was appointed colonel of the 28th Pennsylvania Infantry on June 28th, 1861 and joined General Nathaniel P. Banks in Harpers Ferry. Throughout his Civil War career, Geary built upon his reputation for bravery and military skill. In 1862, Geary was wounded at Bolivar Heights and captured in Leesburg. Though he was twice wounded at Cedar Mountain, he went on to fight in Chancellorsville and Gettysburg. Geary’s “fitness to command and promptness to execute” may be best characterized in his courageous command at the Battle of Gettysburg. On July 3, 1863, the general led a bold counterattack, driving Confederates from their breastworks on Culp’s Hill. Geary’s efforts at Culp’s Hill critically protected the Baltimore Pike, the Union army’s lifeline at Gettysburg. Despite saving the Union lifeline, Geary could not protect his own son, who was killed in the Battle of Wauhatchie in Tennessee in the fall of 1863. Grief did not stop Geary, however, who continued on to see action at Chattanooga and in the Atlanta Campaign, where he commanded the 2nd Division of the Twentieth Corps. Never missing the opportunity for a political role, Geary briefly served as military governor of Savannah in the winter months after Sherman’s March to the Sea. After the war, Geary returned to Pennsylvania and served as governor, running as a Republican though he had been a lifelong Democrat. On February 8, 1873, shortly after his second term as governor ended, Geary died of a heart attack and is buried in Harrisburg, Pennsylvania.